Audio Books–Do You Listen to Them? Children’s Book Week has meant all sorts of new adventures for me. In addition to going to see a production based upon Judy Blume’s classic Tales of a Fourth Grade Nothing, I am reading a book in a format I usually avoid–audio. I have a confession to make first. I didn’t know this was an audio book when I requested it from the Amazon Vine program. This program allows you to request a certain number of items each month and post a review on Amazon. I don’t participate much in the program because I have so many other books to read for my blogs, but when I find something of interest I’ll send in a request. I am currently working on a middle grade historical, part of which will be set at Wheaton College in Norton, MA–which during the time of my story was Wheaton Female Seminary. 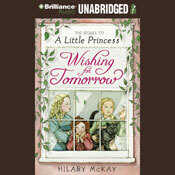 I wanted to get a feel for life at an all girl seminary and thought Wishing for Tomorrow by Hilary McKay would be perfect. When I discovered it was an audio book, I have to admit I was disappointed. I’m not the kind of person who can listen to music while she works, let alone try to pay enough attention to a story at the same time I’m working. I have found, however, that these compact discs are perfect to listen to in my truck while on the way to the grocery store or when I have a bunch of errands to run. I’m truly enjoying the story. The characters are all so different, and narrator Justine Eyre does a wonderful job of breathing life into these characters and capturing their essence. Do you listen to audio books? If yes, how often? What do you like about them? Is there anything you don’t like about audio books?